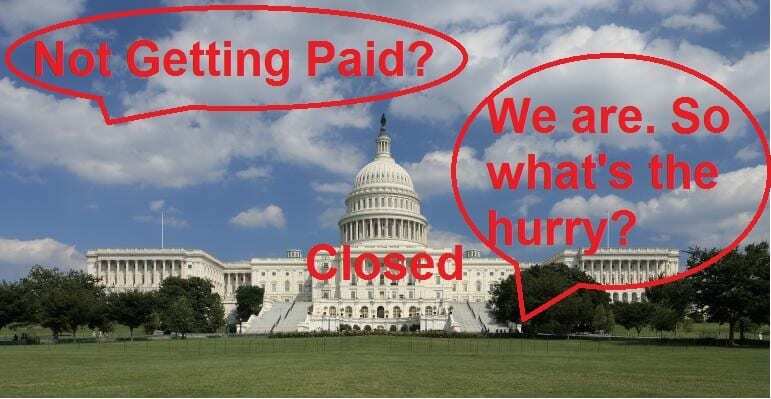 WILL THE GOVERNMENT SHUTDOWN SEND YOU INTO BANKRUPTCY? As we end the first week of the government shutdown my office has been flooded with calls from nervous government workers and subcontractors. Losing several days of pay over the course of a few months during the sequestration or furlough was one thing. However, to lose a week’s pay or possibly several week’s pay is entirely a different matter. Cut, cut, cut. Human nature is optimistic. We always like to assume the best. “It will end soon”, most people are telling themselves. It may. However, the loss of a few hundred to a few thousand dollars in income can throw your budget into chaos. Cut, cut, cut. Stop eating out. Shut down you air conditioning and open the windows. Call your mortgage and car company as see if they will defer a payment. All of this may not be necessary but you will feel like you are taking action. Even more importantly, you will not be spending money. -If you normally get a large tax refund considering adjusting your withholdings for the remaining months of the year to get the money in your pocket now. Consult a financial advisor about this. -Bring your family in on the situation. Everyone in the house should know that belts must be tightened. -Work on things around the house you have had on your “Honeydew” list. It will take your mind of your stress and make your feel like you are accomplishing things. -Shut off the TV. Don’t let the ping pong commentary about the government shutdown keep you in constant stress. There is nothing you can do about it. Even if the federal shutdown ends tomorrow you need to watch out for the “financial snowball effect” of the small loss of income. No matter how you look at it, the loss of income means giving out a little less candy at Halloween, a smaller turkey at Thanksgiving, and a thinner stocking at Christmas. The longer the shut-down goes on the greater the time it will take to recover and the greater damage you will suffer. Get advice early if the snowball you are pushing is large. Many people were living paycheck-to-paycheck when the furlough hit. They may have relied on credit cards to make up the small loss. However, this second punch to the financial pocketbook will be much harder to recover from for many. Get advice early is the strain is keeping you up at night.